1998 Ram 1500 SST, 102,116 miles, options include: Rear Wheel Drive, a Spare Tire (Full Size), a Drivers Air Bag, Vinyl Interior, an AM/FM Stereo, a Gasoline Engine, a Bench Seat (Split), Steel Wheels, an Auxiliary Power Outlet, Anti-Lock Brakes, Intermittent Wipers, a Passenger Air Bag, a Cassette Player, an Airbag On/Off Switch, Variable Speed Intermittent Wipers, and Power Steering. This 1998 Dodge Ram 1500 SST 2dr Reg Cab 119" WB, Stock number 8576 features a Emerald Green Pearl exterior. Factory equipped with an impressive 8cyl, 5.9l, 245.0hp engine, an 4-speed automatic w/od transmission and rear wheel drive, this Dodge Ram 1500 SST is ready to conquer the roads! 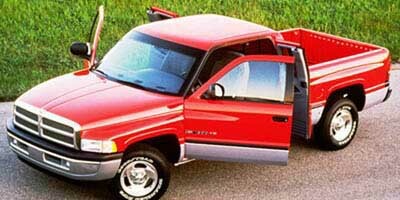 Contact us today to schedule a test drive of this 1998 Dodge Ram 1500 SST 2dr Reg Cab 119" WB! Or stop in at 520 East Main Whiteland, IN to check it out in person! This awe-inspiring vehicle as well has an Auxiliary Power Outlet and a Cassette Player.